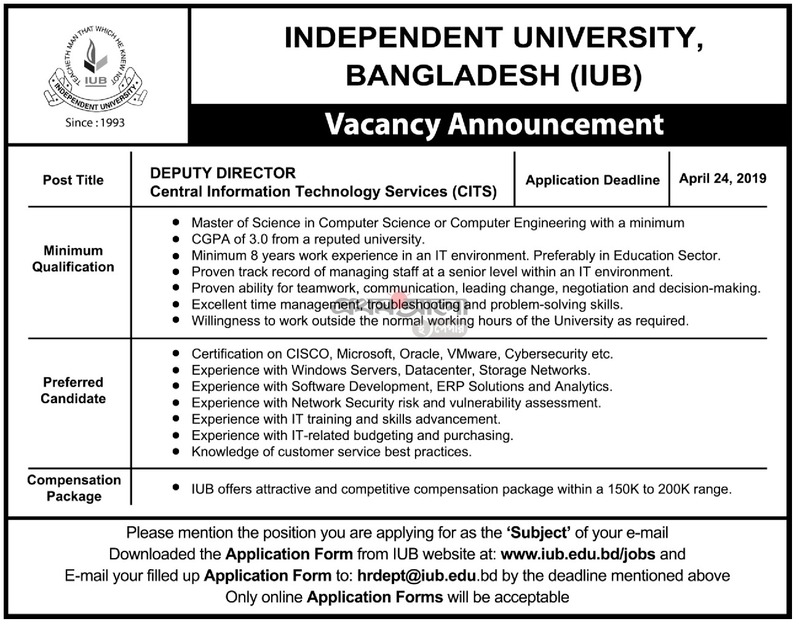 Independent University Bangladesh IUB Job Circular 2019 has been published by the authority. It’s a huge chance to get a job to unemployed people. Independent University Bangladesh IUB is the most popular private university in our country.Independent University, Bangladesh (IUB) established in 1993 is the leading private university in Bangladesh with an explicit focus on Research and Global Partnerships. We are a full service, an oriented university with a current enrollment of 5,500 students, 8900 Alumni and 250 faculty members (of which 25% have Ph.D.’s mostly from North America). Independent University Bangladesh IUB is the largest private university in Bangladesh. RecentlyIndependent University Bangladesh IUB published an attractive job circular. This job circular is contained many categories. So that, many people to get a chance to achieve this job. Anyone can apply for this job for the better career. Because this job is too much important at this moment. To get Independent University Bangladesh IUB Job Circular 2019 related all information, you can visit my website that is jobs.lekhaporabd.com. Independent University Bangladesh IUB Job Circular 2019 has been converted to an image file and that image file has been given below. IUB’s goals are to produce graduates of international standards within the local environment, with knowledge and relevant skills to provide leadership in enterprise, public service, and welfare; encourage and support useful research; create knowledge; and provide further learning opportunities for adults. The curriculum objectives for the undergraduate education are to teach communicative skills (oral and written communication and computer skills) with a strong humanities background, knowledge and competence in a subject (i.e. a major), and a sub-specialization (minor) in a related subject. This is commensurate with the ultimate goal of equipping students with middle management skills and the background necessary to pursue higher studies.